PHOENIX – (April 27, 2015) – Arizona Cardinals’ Pro Bowl Cornerback Patrick Peterson was busy last week both fund raising for and giving back to the community through his Foundation for Success. On Monday evening, sponsors and special guests of the Patrick Peterson Celebrity Golf Challenge, including Alice Cooper, joined the all-star at the Omni Scottsdale Resort & Spa at Montelucia Kasbah Patio to kick off the events of the week with a private VIP reception hosted by Debbie Gaby. Guests enjoyed cocktails and hors d’oeuvres while they bid on sports memorabilia, fine jewelry and luxury vacations in a silent auction. Peterson and his teammates, including Justin Bethel, Larry Fitzgerald, Brittan Golden and Rashad Johnson traded in their uniforms and helmets for clubs and tees to become celebrity golfers on Tuesday afternoon at Topgolf Scottsdale at Riverwalk. Celebrities and guests alike enjoyed an afternoon of point-scoring golf games and premium food and drinks hosted by Debbie Gaby’s Charities and Fox Sports 910 Phoenix. A program of the Patrick Peterson Foundation for Success, “Patrick’s Corner” provides access to books and a fun environment to read with friends and family for at-risk students. With the help of The Sundt Foundation, Peterson revealed his second “Patrick’s Corner” to the students and families of Frye Elementary School on Thursday afternoon at a press conference and ribbon-cutting ceremony. Following the reveal, Peterson visited with the students and their families. 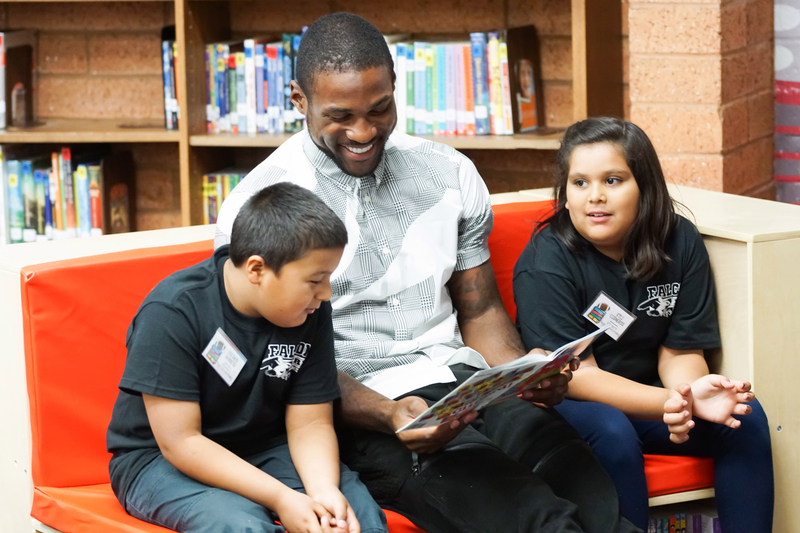 The Patrick Peterson Foundation for Success aims to install eight “Patrick’s Corners” in Title I schools and inner city community centers throughout Arizona by the end of 2017 to make more than 20,000 books available to over 5,000 children annually. Established in 2013, the mission of the Patrick Peterson Foundation for Success is to provide low-income and inner city youth with opportunities and resources to reach their full potential. For more information, please visit patrickpeterson.org.